Brussel sprouts are one of the most maligned winter vegetables, probably because they are often cooked so poorly. They are usually served whole, overcooked, and under flavored — but this doesn’t need to be the case. For years I didn’t eat them, didn’t cook them, thought I didn’t like them. Then I realized I was just cooking them incorrectly. Boring boiled and buttered, that was it. Then I found out that simply trimming and halving the Brussels sprouts, or better yet shredding them, brings out the flavor inside these tightly, delicately layered mini cabbages. Then just add flavor. In this recipe it comes from diced smoked ham and toasted pecans, which add both flavor and crunch. The crunch is a nice extra that you don’t often find in a vegetable recipe. Trim the stem end of the Brussels sprouts and remove any yellow or spotted outer leaves. Cut the Brussels sprouts into very thin slices about 1/16 inch thick, and use your fingertips to separate the slices into shreds. Alternatively, shred the Brussels sprouts using a food processor with the coarse shredding disk attached. Place in a bowl and set aside until ready to sauté. In a 14-inch sauté pan, melt the butter with the olive oil over medium heat and swirl to coat the pan. Add the garlic and sauté for about 1 minute until soft but not browned. Add the Brussels sprouts and sauté for about 3 minutes until bright green and barely crisp-tender. Raise the heat to high and add the ham and stock. Stir to blend, cover the pan, and steam for about 2 minutes longer until the Brussels sprouts are crisp-tender. Season with a little sugar, salt, and pepper. Transfer to a warmed serving bowl and top with the toasted pecans. Serve immediately. These sautéed vegetables are best when made right before serving. However, the ingredients can be prepared and chopped up to 8 hours in advance. 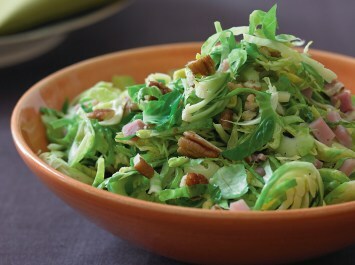 Cover the prepared Brussels sprouts, garlic, and pecans and set them aside at room temperature. Chop the ham and place it in a covered container in the refrigerator. Give this recipe for delicious brussel sprouts a try for your next holiday gathering, or any day you want a different delicious side dish. This delicious recipe is from a wonderful cookbook called New Thanksgiving Table: An American Celebration of Family, Friends, and Food by Diane Morgan. Don’t let the name fool you. This cookbook is perfect for year round cooking, especially entertaining. It is one of my favorite cookbooks and I have tried quite a few recipes from it. I think you will love it. It is one of the few cookbooks I recommend without reservation. You will find a review of this cookbook on the Cookingnook site here.